Malachi Bradley was searching for wild mushrooms in eastern Utah when he realized he had wandered too far from the mountain lake where he was hiking with his father and siblings. The 10-year-old boy tried looking for a road to flag down a driver, but the area about 200 miles east of Salt Lake City was too remote. He remembered the survival skills his father taught him and eventually hunkered down between rocks still warm from the sun to shield himself from the cold mountain night. "It was weird not having anybody with me, but I just kept going. I knew I had to make it back, or my family would be really sad," Malachi said. Over the nearly 30 hours he was missing in the rugged backcountry, he found river water to drink and even tried unsuccessfully to catch a fish with a spear made from a stick. Meanwhile, dozens of search-and-rescue workers were combing the area on horses and ATVs, as well as in the air, but they couldn't spot Malachi in the wooded terrain. 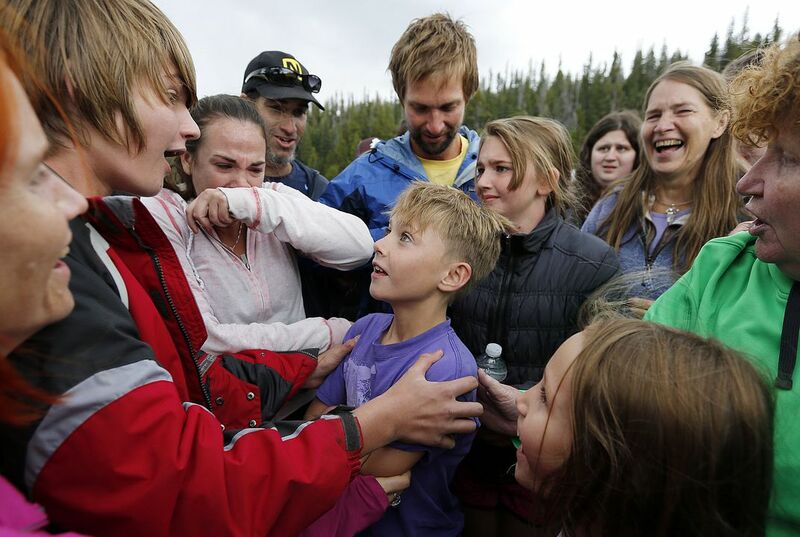 Back at the campground in the Uinta Mountains, his mother, Molly Chrisman, was on edge. She had heard about a 5-year-old Arizona boy who wandered away from a campsite while chasing grasshoppers and died of exposure. "I felt like the forest was so huge," she said. "They were showing pictures on a map of how many people they had on the ground, and it felt like it was a tiny amount compared to the vast place that was the forest." As night fell and temperatures dipped into the 30s, Malachi wrapped his T-shirt around his legs, huddled in his jacket and shielded himself from the weather between the rocks. 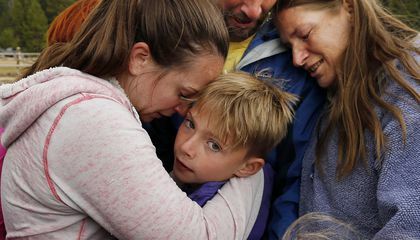 The residual warmth helped him get through the night, though it also threw off infrared heat detectors used by the search teams as it got dark, police said. Back at Paul Lake, his father, Danny Bradley, and a friend who had joined them for camping were keeping a fire burning, hoping the boy might wander back on his own. As the hours wore on, Bradley imagined his son alone in the woods and was terrified that he might be hurt. "I was just hoping he was able to stay warm enough," the father said. The next day, Malachi heard a police helicopter flying overhead. He knew the searchers aboard the craft couldn't see him through the trees, so he started walking again until he found a clearing. He stayed there, briefly falling asleep, until a search plane spotted him from the air and a helicopter landed to pick him up Aug. 24. When she saw it land, his mother was overwhelmed with relief. "He's healthy and he's coming up and this is going to be all over and it's not a tragedy," Chrisman said, describing her reaction to the news. Medical staff on scene declared him cold and hungry but otherwise fine. Malachi was found about 5 miles southeast of where he went missing, Uintah County Sheriff Vance Norton said. It appeared that he wandered down a ravine and over a hill before he found the clearing. Though the night was cold, Malachi was lucky that temperatures didn't drop further and no sudden storms developed in the high-elevation area, Norton said. Malachi said he'll go camping again, but next time he'll stay close to other people. "I'll learn from my mistakes," he said. How did the sun provide warmth at night? Very touching story and I'm glad that the boy is safe with his family. The father was very smart teaching him survival skills and they saved his life. The story is about a kid who was following a butterfly and got lost in the trees and used a spear to get a fish and the sun made the rocks warm and was wrapped in his shirt and covered himself with his jacket.People were looking for him walking, helicopter,and boat. His mother was worried. This shows that culturally we have advanced with technology greatly. We were able to use new infrared tools to search for the boy. This also shows that part of his culture from living in a location near the woods, he was taught at a young age how to survive by himself. This taught him to be independent and to fend for himself. If he had lived near the ocean it would have been different. There, he would have been taught how to swim at a young age instead of how to survive in the woods. I don't think it was very smart for the boy to wander off like that. I also think it was partially the dads fault for not paying attention to him. Surviving in the cool mountains would be very scary an dangerous. I don't think personally I could. The skills his dad taught helped him survive. His father taught him important skills that saved his life. Happy that he made it back to his family. The boy felt weird not being with somebody but I would feel a little scared and lonely.It is good that the boy found his family and was not lost for more days.If that happened to me I would not go back or next time I went hiking I would stay close to one of my parents. The sun provided warmth at night, because during the day the heat of the sun would heat up the rocks or boulders. And throughout the night the heat will stay trapped in the boulder, kind of like a heater. I think that Malachi Bradley was very smart to think of sitting between the rocks for the warmth and heat. The warmth of the sun got trapped in-between the rocks, which gave him warmth. The sun helped him survive because it kept him warm through the night and also threw off the infrared heat detectors the search team was using.